Just to give everybody the heads up. I was interviewed by Gary Parr and Christine Williams for the Fiber Talk podcast! We spent an hour talking of stitching stuff . I really enjoyed the chat. This morning I was working on the Austarlia sampler for my parents, so I had time to listen to this podcast. I enjoyed it very much and it was great to hear your voice again. Just delightful, Sharon. And I loved hearing your laugh!!! 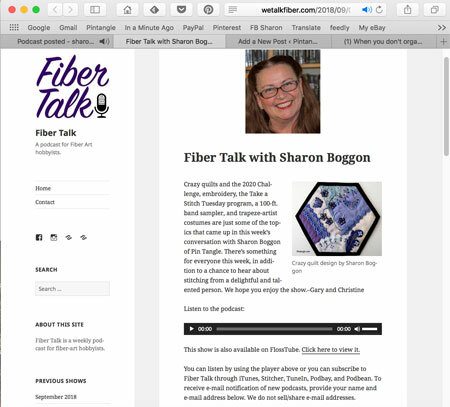 Sharon, So enjoying the most interesting interview with Fiber Talk…..when the battery gave way on my tablet…….such a good excuse to listen again with a fully charged battery!